and Imperial Counties. Our fraternity has relevance and purpose as demonstrated by the increased interest in Masonic membership. Our individual lodges are involved with our communities to enhance the quality of life for all our citizens. Division IX Freemasons take pride in their lodges and in performing ritual that is well-rehearsed and delivered with reverence, meaning and pride. Division IX Freemasons live, act and demonstrate our basic Masonic tenants in their daily lives. 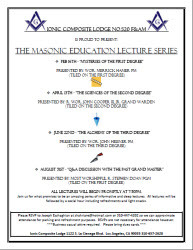 · And in accordance with the Constitution and Edicts of Grand Lodge. By the creative use of information technology, the centralization of leadership manpower for certain Division-wide events, and frequent contact with our constituent lodges, assist in addressing any issues or concerns that may arise in individual lodges and/or districts. Ensure open lines of communication between the Grand Master, Inspectors and constituent lodges within Division IX, and disseminate information from the Grand Master in a timely manner. Ensure ritual conformity and proficiency division-wide and assure constituent lodge compliance to the administrative rules and regulations of Grand Lodge. Work diligently with concordant bodies to foster a spirit of cooperation, Masonic unity and harmony within Division IX. This strategic plan along with its goals and objectives will be reviewed annually to ensure Division IX is meeting its requirements, making adjustments and expanding the scope of the plan when necessary.